Looking for a ready-made setting to bring to your Fate table? 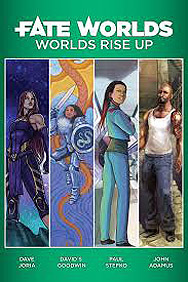 Fate Worlds: Worlds Take Flight brings four outstanding settings to stimulate your imagination and get you gaming fast. Masters of Umdaar: The fallen world of Umdaar is home to cyborg insects, merciless warlords, and lasers - lots and lost of lasers. Quest for long-lost artifacts of power and return hope to your people. Nest: There is a place where children go to slay dragons solve riddles, and learn magic, only to grow up and forget these fantasies. Protect your past from something terrible and very, very real. Behind the Walls: Being in prison is bad enough, but when the world outside goes silent post-nuclear attack, it's hard to know what to think. Find a way to survive the cell block chaos, because it just might be safest behind the walls.